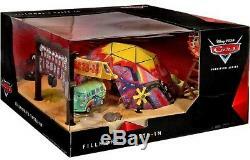 Disney Cars Precision Series Fillmore's Taste-In Playset. 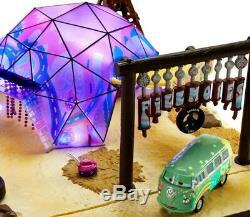 Build out your Disney Pixar Cars world with this light-up Fillmore's Taste In Cafe! This premium playset comes to spectacular life with lights that flicker on and off and authentic decos, so you can recreate favorite scenes from the movie! Iconic, true-to-movie details abound, like the beaded curtain, weathervane that spins, and vintage Taste-In sign are just some of the cool features of this playset. There are three different light pattern modes inspired by the movie and a light sensor that gets activated when in the dark so the dome lights up! 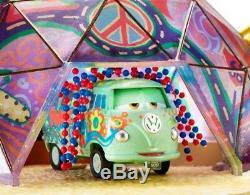 The exclusive die-cast Fillmore vehicle also glows when parked inside; it's colorfully cool! This set connects to other Precision Series sets for even more Radiator Springs fun. Drive on in and keep the Disney Pixar Cars action going and going! Requires 3x "AA" batteries (included). The item "Disney Cars Precision Series Fillmore's Taste-In Playset" is in sale since Saturday, September 1, 2018. 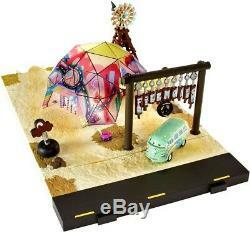 This item is in the category "Toys & Hobbies\TV & Movie Character Toys".com" and is located in Suffern, New York. This item can be shipped to United States, Canada, United Kingdom, Denmark, Romania, Slovakia, Bulgaria, Czech republic, Finland, Hungary, Latvia, Lithuania, Malta, Estonia, Australia, Greece, Portugal, Cyprus, Slovenia, Japan, China, Sweden, South Korea, Indonesia, Taiwan, South africa, Thailand, Belgium, France, Hong Kong, Ireland, Netherlands, Poland, Spain, Italy, Germany, Austria, Bahamas, Israel, Mexico, New Zealand, Philippines, Singapore, Switzerland, Norway, Saudi arabia, Ukraine, United arab emirates, Qatar, Kuwait, Bahrain, Croatia, Malaysia, Brazil, Chile, Colombia, Costa rica, Dominican republic, Panama, Trinidad and tobago, Guatemala, El salvador, Honduras, Jamaica, Antigua and barbuda, Aruba, Belize, Dominica, Grenada, Saint kitts and nevis, Saint lucia, Montserrat, Turks and caicos islands, Barbados, Bangladesh, Bermuda, Brunei darussalam, Bolivia, Ecuador, Egypt, French guiana, Guernsey, Gibraltar, Guadeloupe, Iceland, Jersey, Jordan, Cambodia, Cayman islands, Liechtenstein, Sri lanka, Luxembourg, Monaco, Macao, Martinique, Maldives, Nicaragua, Oman, Peru, Pakistan, Paraguay, Reunion, Viet nam, Uruguay.